The rotating pantry models always include a basic cabinet for a true "built-in" look. Two models are available for either a wall or corner installation. 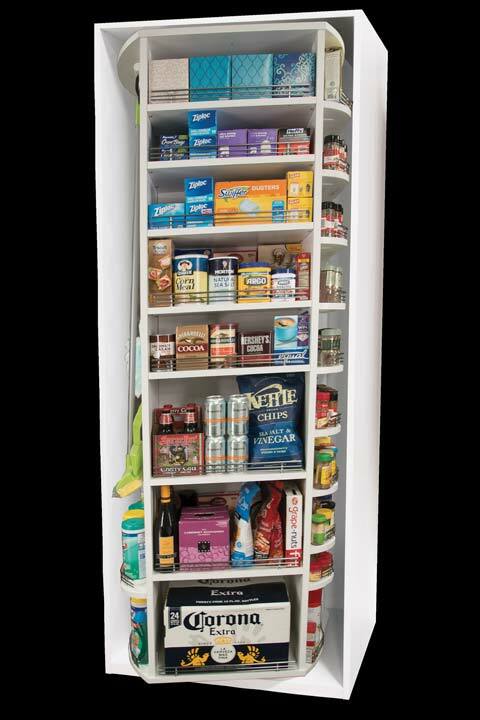 The NEW 360 Organizer® Wall Pantry can be built into your kitchen cabinetry design. With a 31.5" wide footprint, it is smaller and narrower than the other 360 Organizer® models and integrates very well into a small pantry closet. The unit, when fully enclosed by the cabinet, is 31.5"W x 26"D x 84"H. As is spins, the shelves require an additional 4" depth, bringing the total depth requirement to 30" - see diagram below. The main shelves are 14" x 18" on one side and 3-7/8" x 18" on the other. Side shelves measure 3.5" x 18". All shelves for this wall pantry model include chrome fences to ensure items stay put. Optional doors are available to close off the cabinet when not in use and blend seamlessly with most kitchen cabinetry designs. Closet lighting and optional features like drawers or pull-out racks are also available to customize your design. The NEW 360 Organizer® Corner Pantry increases storage by eliminating those dead corners and making every inch count for kitchen storage. With a 32.75" footprint, it blends very well with your kitchen cabinetry, requiring less depth than most refrigerators. The dimensions, with cabinet, are 32.75"W x 32.75"D x 84"H. The main shelves are 14" x 18" on one side and 3-7/8" x 18" on the other. Side shelves measure 3.5" x 18". All shelves for the corner pantry model include chrome fences to ensure items stay put. Like all 360 Organizers®, the unit spins smoothly and silently through manual rotation. The Corner Pantry is fully customizable to meet the unique needs of your design — doors, drawers, lighting and other accessories can be integrated into this model. 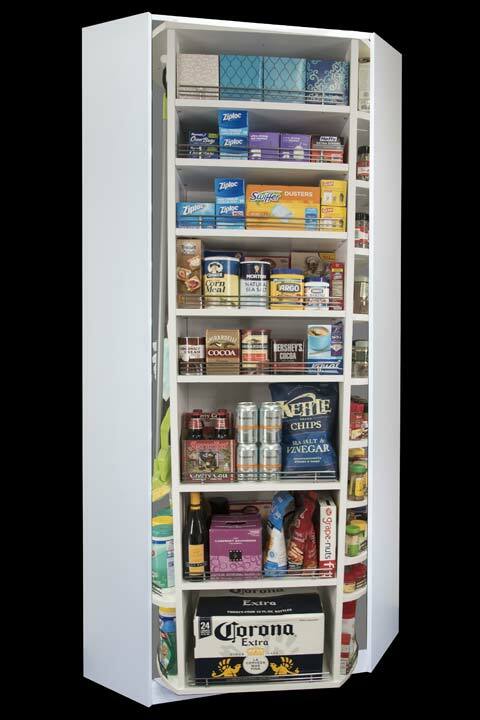 The 360 Organizer® Pantry is designed to fit either in a corner, or along a wall. Both models can be customized with doors, integrated lighting, wine cubes, pull-out shelves, spice racks and more. See your Closet Works designer for details on all the possibilities when bringing a 360 Organizer ® into your home.